As of 20th October 2014, the Royal Mail are changing the small parcel size. Our brand new size guide ruler will be the only one on the market to offer a "Letter", "Large Letter" and the New "Small Parcel" slots. 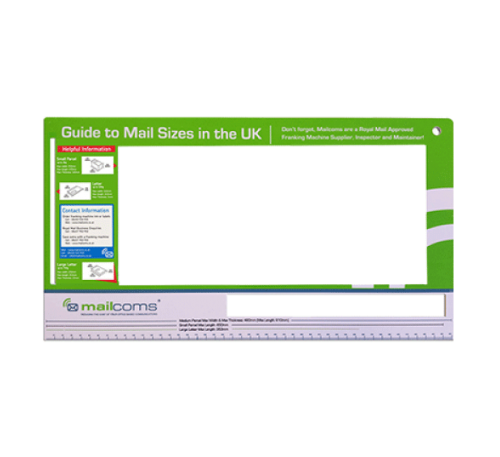 By owning a Royal Mail Size Guide Ruler Template you will be able to measure your mail sizes exactly, meaning that you will eliminate the chance of underpayment and/or over payment of mail. It will therefore allow you to calculate the exact amount of postage charge, potentially saving your business money. Your cardboard version may now look a bit tatty as your slots may not be correct. Instead why don't you treat yourself to a sturdy new version at a very low price. With this brilliant product, you will never get your postage costs incorrect again.